Opis: NGC 4650A appears to be two galaxies in one. A rare type of galaxy known as a Polar Ring, NGC 4650A is composed of an old central group of stars and a young ring of stars rotating farther out. Both components are clearly visible in this featured photograph by the Hubble Space Telescope. What creates Polar Ring Galaxies is still being researched, but a leading theory is the collision of two distinct galaxies in the distant past. 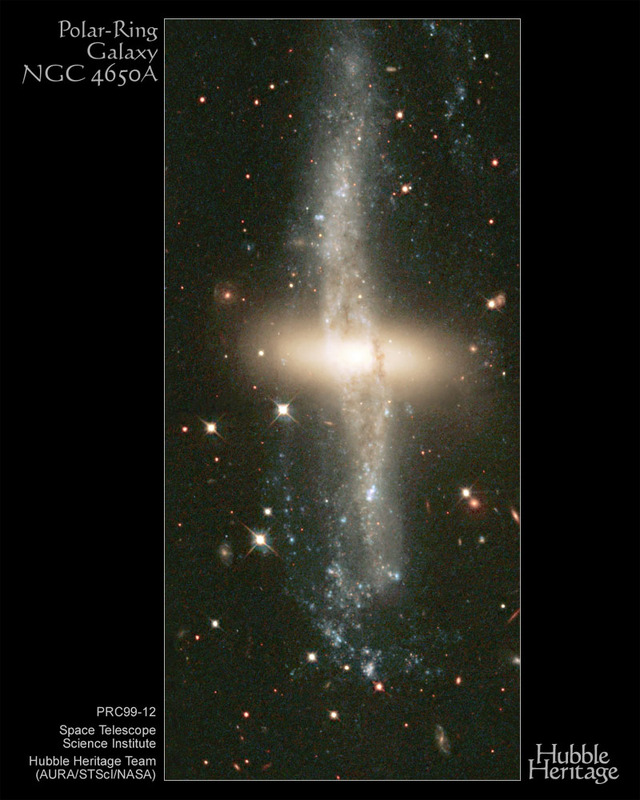 Polar Ring Galaxies allow astronomers to estimate the amount of dark matter in galaxies by measuring the rotation rate of the highly extended ring. An unknown type of dark matter is implied because the ring typically rotates too fast to be held together by only the visible stars.